Most people usually don't think much about jar lids. They are usually just tossed in the trash or put in the recycling bin. I have a few ideas for this lid that could be considered "creative" repurposing. The ideas below would be great for mixed media art or for crafting with kids. So, the next time you throw that lid away, you may want to give it a second thought. Turns out you may be able to add it to your creative art explorations! 1. Use the lid fo make repetitive or random circles on a canvas or in your journal. 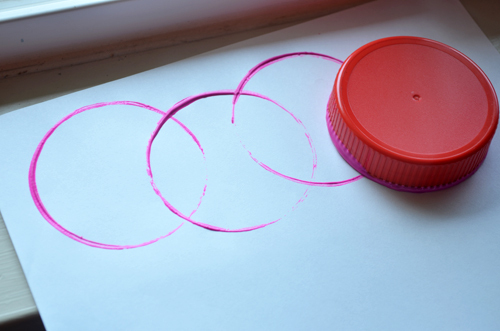 The lid would also come in handy for making a perfect circle for making a pattern! 2. Use the lid to cut shapes in dough or clay. I could imagine a bucketful of lids ready to go for playing with during recess. Smaller lids would also be perfect for making circles for jewelrymaking (pendants) and ceramic projects (holiday ornaments)! 3. 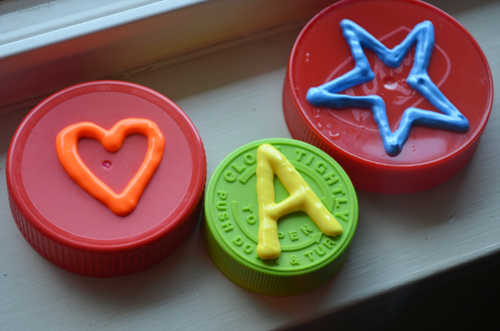 Use some Puffy Paint to add shapes on top of the lid to make cool personalized stamps! Make sure that the paint is thick enough that it will make a nice stamp that stands out from the base. The thicker you apply the paint, the longer it will take to dry, so wait a couple days after you apply a heavy application before you load your stamp for use! 4. Lastly, lids make the perfect little palette for small painting or decoupage projects. This is a great solution for when you are hosting a painting party with kids and each person gets just a small portion of paint. 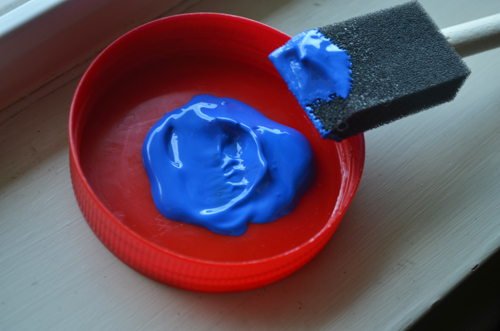 The lid isn't too deep and it doesn't really matter if the paint or glue dries inside it! It could be reused time and time again! Hope you find these little tips helpful for your next art project. Repurposing a lid for arts and crafts projects isn't rocket science, but it's always nice to have simple supplies that go the extra mile (and don't cost anything)! 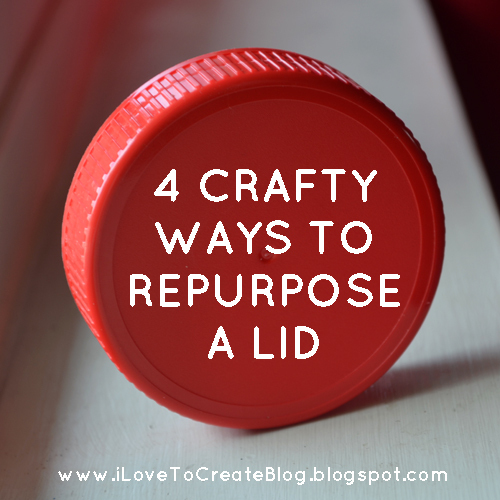 What other crafty uses can you think of for a basic lid? i use the lids from soda bottles, milk jugs, half and half or any small lids for finger pin cushions. learned it in high school about 15 years ago. they are easy and fun to make. That's an awesome idea and a nice little gift to make and give. My granddaughters and I have been saving pepsi bottle games for almost a year. We are planing on making a Christmas tree out of them. That will look really neat when it's completed! Be sure to share a pic on our FB page. Instant DIY! That would be so fun! Great way to make some steampunk goggles! I cut out a jack-o-lantern from adhesive foam and stuck it on a lid...made a great stamp! 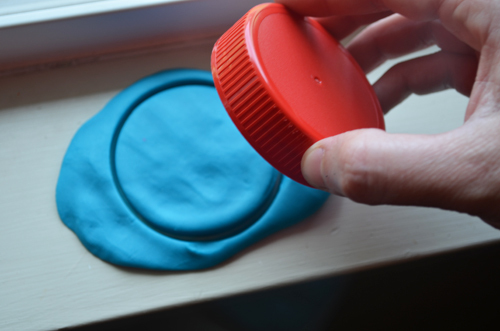 You could make all kinds of fun stamps with lids and adhesive foam sheets! I made counting ladybugs when my daughter was younger. I used lids from sport drink bottles, covered with red felt(glued) and then used craft and puff paints to create the ladybug. Each one had a different number of spots. It made it fun to learn counting. for those that need an extra hand when making paper rosetts use the lid off of different items like peanut butter jars. and push them down in to glue the back on and be able to fan them out evenly they work wonders. I made little inedible cupcakes, using the lids as the cupcake base. I collected enough to use as checkers for a homemade checker board. Kids loved it. Cut little photos to fit inside the lid and put a magnet on the back. You can glue ribbon around the sides to make it stand out even more. I work at a skilled nursing facility. The activities dept. uses hundreds of 2L bottle lids for Bingo markers. They are easier for arthritic hands to manipulate than regular chips. Lids are also good for stacking, nesting and sorting.